Ovulation tests are really useful when charting your cycle. The thing is that many fancy (digital) ovulation tests are pretty expensive to use cycle after cycle. I therefore recommend to all my patients to use the simple dipstick LH tests with nothing more than a test line and control line. So let me show you how you can start using them too and not break the bank while you’re charting. 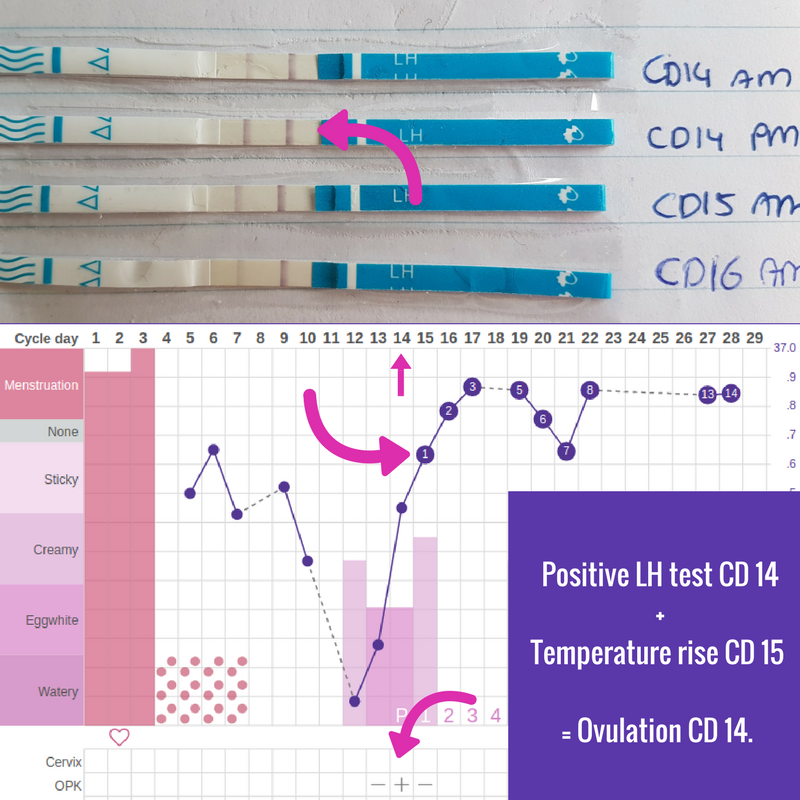 Both Ovulation Predictor Kits (OPK’s) and Luteinising Hormone strips test the same thing: luteinizing hormone (LH). LH triggers ovulation and so knowing when it spikes helps you identify when you may be ovulating. So if you are starting out and you prefer to get one of these nonetheless, by all means! But if you would like to start with the cheaper simple LH strips, here is how! If you have just started out with charting, begin testing on cycle day 10. Rember that cycle day (CD) 1 is the first day of menstruation. Once you have charted for a while, you will know when you tend to ovulate and starting 2-3 days before that will be good enough. If you have already been charting your temperature, choose the earliest ovulation day you had in the last 3-6 cycles, and start testing 2 days before that. 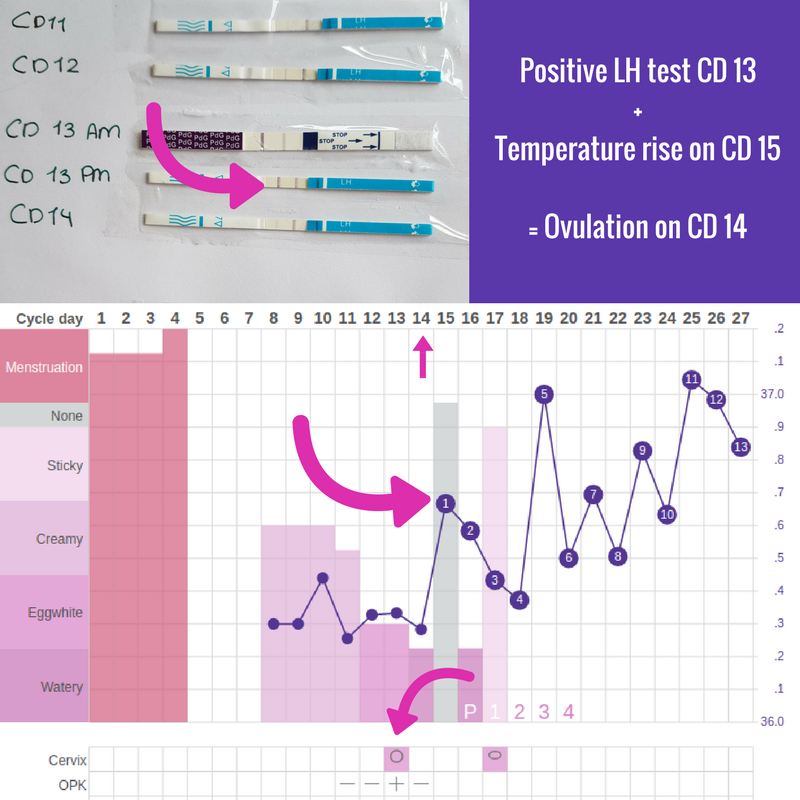 So if the earliest temperature spike you had was on CD15 for example, then you ovulated CD14, so start testing on CD11 or 12. Test with mid-morning or early afternoon urine. LH is not all released at once but rises and falls for 1-2 days. It starts to be released early morning and it takes 4-6 hours to show up in your urine. Therefore first morning urine is not very useful like it is with pregnancy tests. Catch urine in a clean and dry cup. Stick the strip in (right side in!) but no further than the line indicates. you have 2 lines but they are not equally dark. Once they get close in darkness, it may be worth it to start testing twice daily so that you do not miss the positive test. you have 2 lines that are equally dark or the test line is darker than the control line. Once you get a positive, you will likely ovulate in the next 24-36 hours. If you are trying to conceive, make love at least once a day now. Stick every test underneath each other on a piece of paper with the date and/or cycle day so you can compare the lines. Keep testing until the 2 lines are no longer equal. You should soon be able to see your temperature (BBT) go up. If you are trying to conceive remember to keep making love at least daily till you have that confirmed ovulation. Here is a picture of what these tests look like. As you can see from my tests & chart, on the morning of CD14 the line was pretty dark and so I tested again in the evening. That was a good idea because that test was positive (test line and control line are equally dark) while the next day it was negative again because by then I had already ovulated as the next day’s temperature spike shows. Here is one more. Ignore the purple test strip, that is the MFB progesterone test that I have tested! Back to the picture below. Here you can see I had a positive LH test on CD13 when the two lines were equally dark. My temperature did not go up till CD 5 though, so I ovulated CD14. The LH strips tend to all look the same but may have different colors depending on the brand. I hope you feel equipped to start testing! Want to learn to chart your temperature too? Get a BBT thermometer and sign up for the free course Basics to Fertility Charting. If you ever notice that you are getting several positive ovulation tests per cycle, then watch this video. When you get multiple positive ovulation tests per cycle.